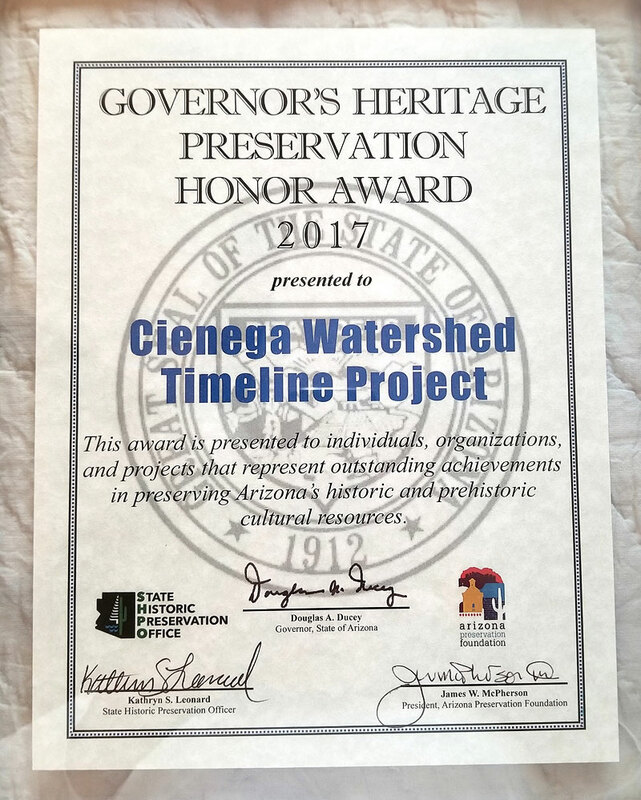 On June 16, the Cienega Watershed Timeline Project received a Governor’s Heritage Preservation Honor Award to recognize this effort as an outstanding achievement in preserving Arizona’s past. 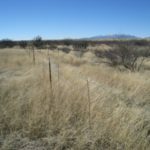 The project is rather unique in Arizona preservation efforts. 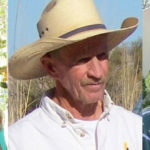 The project is a publicly accessible, web-based interactive timeline – an updatable series of events known for the watershed and its neighboring Arizona communities, at www.cienega.org/timeline. Now in its fifth year as a collaborative effort, the work is being accomplished by volunteers, retired professionals, and hosted employees from organizations with expertise in archaeology, archives and library science, history, historic preservation, ecology, wildlife biology, landscape ecology, hydrology, software development, and other disciplines. 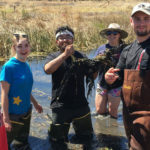 Hosted by the Cienega Watershed Partnership, participating groups include the Empire Ranch Foundation, Colossal Cave Mountain Park, Vail Preservation Society, the Nature Conservancy, USDA Agricultural Research Services Southwest Watershed Unit, and U.S. Fish and Wildlife Service, with participating staff and retirees from the Coronado National Forest, Bureau of Land Management, Pima County, and Pima Association of Governments. 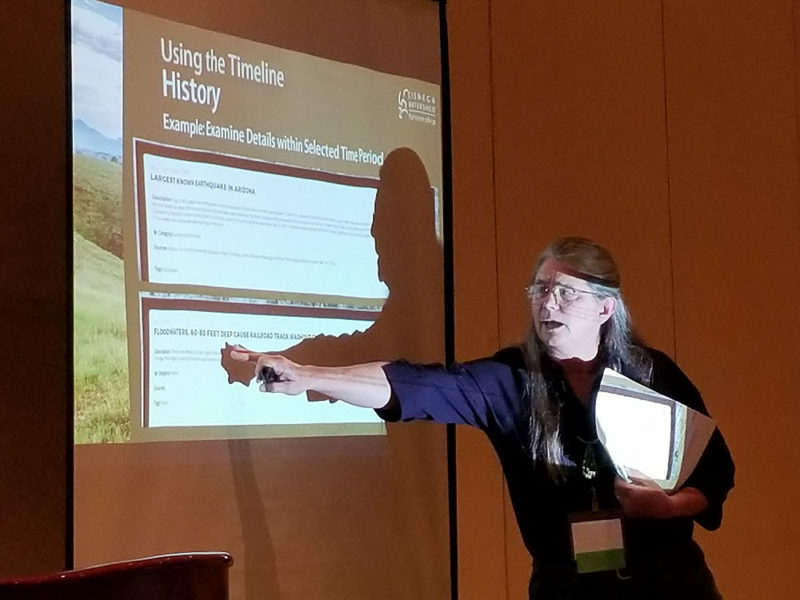 Cienega Watershed Timeline Project member Robin Pinto presents the Cienega Watershed Timeline at the 2017 Arizona Preservation Conference. Over 700 events have been entered so far, making the timeline a valuable tool for exploring the history of land change and researching a variety of topics. The timeline covers millions of years of history in ten major categories of events: Fauna, Flora, Prehistory, Water, People, Land Use, Land Forms and Processes, Legislation/Policies, Climate/Weather, and History. The web-based timeline allows the user to select years, decades or longer periods of time. Below the historical timeline are graphs of the known climatic factors including yearly precipitation, yearly temperature, and estimates of the SPEI drought index. Each event has references, specific citations, and descriptive information along with links and images. Specific events are important building blocks but the timeline makes linkages easy to find. Categories of events, specific tags that describe a subgroup of events, and individual keywords may all be used to identify connections. 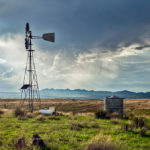 Themes such as droughts and floods, families who affected the watershed’s development, government agencies and policy influences, and archaeological research are all easy to follow. The timeline is integrative, including observations by individuals, and also reveals more current and sophisticated analyses using LIDAR mapping and GIS applications. Both biological and natural events in the watershed are recorded along with historical events. 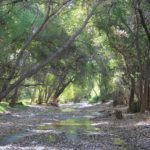 While the primary focus is the Cienega Watershed, the wider area includes Tucson, the Santa Cruz basin, the San Pedro River watershed, and the events that punctuate the history of the region. 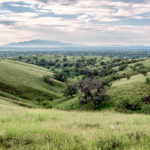 The timeline includes information on the larger stories of pre-colonial settlement, the Spanish and then Mexican peoples and policies, Anglo settlement and development, establishment of Arizona, and the signatures of Southern Arizona lifeways related to ranching, mining, transportation, community growth, education, and development. 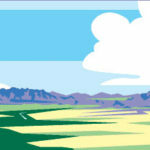 View the Cienega Watershed Timeline now. Header photo, members of the Cienega Watershed Timeline Project flanked by representatives of the State Historic Preservation Office and the Arizona Preservation Foundation. courtesy Cienega Watershed Partnership.